Ilhan Omar has won the Democratic primary in Minnesota's House race to replace Rep. Keith Ellison. Omar, a member of the Minnesota House of Representatives, was the first Somali-American legislator in the United States. The district has been safely Democratic for decades, making a victory for Omar in November likely. She and Rashida Tlaib, who won her congressional primary in Michigan last week, will be the first Muslim women elected to the U.S. House. Omar was endorsed by the Minnesota Democratic-Farmer-Labor Party, as the Democratic party is known in the state. 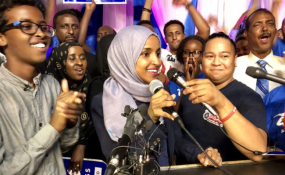 She beat four other Democrats also running for the seat, including former state House Speaker Margaret Kelliher, activist Jamal Abdulahi, state Sen. Patricia Torres Ray, and Frank Nelson Drake, who ran against Ellison as a Republican in 2016. She won with a little more than 48 percent of the vote Tuesday. Omar was born in Somalia and fled the country to escape civil war at age eight. For the next four years, she lived in a refugee camp in Kenya and immigrated to Minnesota in 1997.